The Advanced Settings option allows you to set certain behaviors of the task. Note: Request Record setting only appears for Form tasks. Cancel process if task times out Checked/Unchecked This will allow for the request (instance of the process) to be cancelled if the task is timed out. 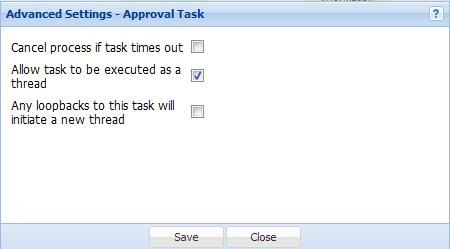 Allow task to be executed as a thread Checked/Unchecked When you need to have multiple recipients each completing the task and they need to work independently on the task, you can select this option. Each recipient will be able to complete their task at different times which could execute multiple threads (future tasks) in your process. For example, I need 5 different recipients to add their input into a form task and each needs the ability to complete without effecting the other's open form task. 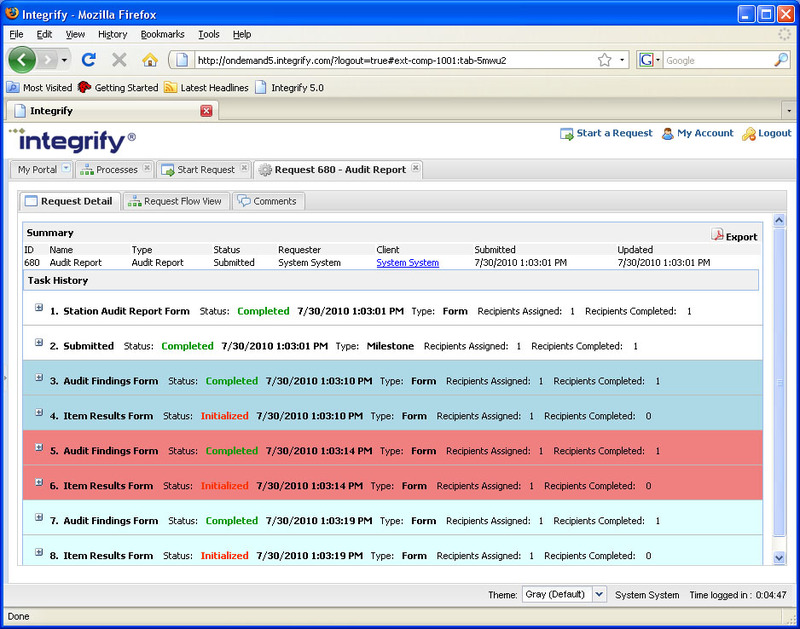 When the task is triggered, the Request Detail will display 5 open form tasks assigned to the 5 different recipients. Any loopbacks to this task will initiate a new thread Check/Unchecked This allows the task to initiate a new thread for the task if the task is started more than once. For example, I may have 1 recipient of a threaded task with my rules defined to allow the task to be started more than once. Each time the threaded task is completed, future tasks that are started based on the completion of my threaded task will initiate a new thread (future tasks with 'Allow task to be executed as a thread' selected that are started. This allows multiple threads of tasks to be worked on independently by users or groups. Make this task a Request Record Check/Unchecked This allows one form task per process to be designated as a Request Record, which can be used to update data for the request on without the form task being assigned to the current user. Click here for more details on setting up a request record. Here is a screenshot of how the threading can viewed within the Request Detail of a process. Refer to the display settings of the process and within task menu's of tasks. There are options for Default Threaded Template and Forms on Top (current thread only). The Default Threaded Template option is shown below. It provides an easier view into the different threads that were defined for the process. We set our Audit Findings Form task with both threading options as show above. 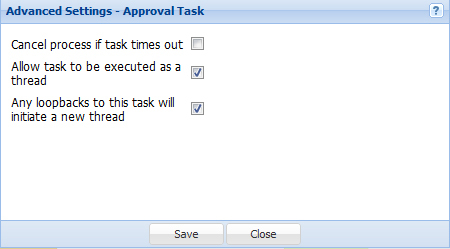 We then set the subsequent Item Findings Form task with only the 'Allow task to be executed as a thread' option as shown above.